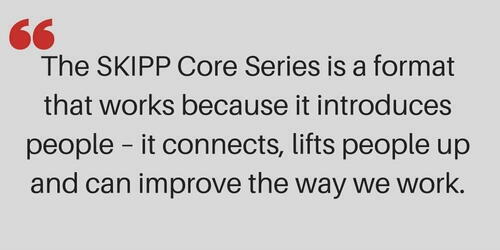 The SKIPP Core Series was wonderful because you got to spend dedicated time with a lot of people who have varied expertise but are all focused on preventing childhood injuries. It was great to connect with so many passionate people – some of whom reminded me of where I was in my work back in my early 20s. I appreciate that so many people were able to take advantage of this opportunity together. You’re not gathering to play a sport – you’re gathering around a topic that you all care about. The fundamental goal is the same but skill sets are very different. It was helpful to be reminded that you don’t know what you don’t know. In the training, other people’s questions made you stop and think. By going outside of your usual setting and network, you become more informed. By being open-minded, we could all gain new perspectives. I thought it would enhance my work. I was mostly interested in the coalition aspect and looking to get to know more people with similar interests. It was a good opportunity to be inspired with others and learn a few new things – to broader horizons and expand my network. I honestly didn’t go into it with specific educational goals, but I learned a ton. The takeaways from SKIPP are very concrete things, and we are using the tools. We covered so much that I’ve already found applicable in my day-to-day work – from gang outreach to fundraising and communications. In my current role, I frequently speak publicly about safety concerns and preventing child fatalities so I valued the communication training aspect. It was really helpful to me. The right message is so important! Child abuse injuries and the connection to unmet social needs of parents is a big one. We are bringing screenings and referral for social determinants of health into public health clinics. We are going to be screening for housing, food, mental health and more. Also, we’ve discovered homeless shelters have not received the sleep safety information. Now, the Healthy Start Foundation is going to work with all the shelters to increase safe sleep practices. Another important change is getting safe storage education for guns in place at the Wake County Sheriff’s Office at time of application. This is an important step that is directly tied to injury and death prevention. There are all kinds of allies for childhood injury and death prevention who can work together. Several of the SKIPP participants are on my child fatality prevention team.